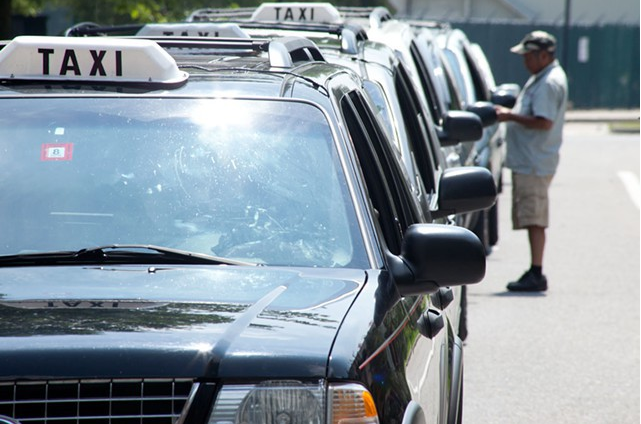 A panel overseeing taxicabs in Burlington has suspended one of the city's largest cab companies for three months and revoked its owner's taxi license following numerous complaints against the company. Burlington’s Taxi Licensing Appeals Panel issued the three-month suspension against Blazer Transportation on October 16, citing a “pattern of disregard for the city’s regulations.” Allegations against the company, which Seven Days has previously reported, included “brazen and unapologetic overcharging of customers” and employing a driver whose license had been suspended for driving under the influence. The panel also revoked the taxi driver’s license of Blazer owner Ricky Handy, and suspended the taxi driver’s license of his son, Christopher Handy, for three months. The panel determined that Blazer and the two Handys violated taxi regulations. The city had renewed the company's and the Handys' city taxi licenses in August, even as the allegations were pending. Ricky Handy isn’t out of the taxi business, however. He said he is working as a dispatcher for another licensed taxi company, J.J. Transit. Drivers who have worked for Blazer are driving for J.J. Transit. Jarvis confirmed that he hired Ricky Handy and is considering buying Blazer Transportation from him once the suspension is complete in January. Ricky Handy said that as long as he's not driving a taxi in Burlington, the arrangement is perfectly legal. Ricky Handy said he continues to operate Blazer Transportation outside the city, including in Stowe, from which Blazer offers service to the Burlington International Airport. While Blazer cabs are banned from the airport, he said he warns those customers in advance that Blazer will drop them across the street, on property where his company is legally allowed to operate. Despite the suspension, Blazer Transportation remains on the list of available taxi companies on the Burlington International Airport website, leaving potential customers no way of knowing the company has been suspended. Last Wednesday, a Seven Days reporter called Blazer to arrange a cab ride from downtown Burlington to the airport. A minivan marked J.J. Transit responded. The driver, who said he worked for Blazer, provided a receipt labeled "Blazer Transportation." Jarvis said his drivers lease the cabs from him. Ricky Handy said the drivers don’t yet have J.J. Transit receipts. After the licensing panel issued Blazer’s suspension, Burlington police issued an alert to its officers to stop any Blazer cabs seen operating in the city or at the airport. Officers were directed to ticket the operator and impound the vehicle. Police Chief Brandon del Pozo said it doesn't appear Blazer has been caught in violation of the suspension. But he said while officers have been instructed to look out for Blazer cabs, enforcing taxi regulations is not a priority for his department unless the drivers are operating dangerously. “What cops are real good at is enforcing observed traffic infractions. Enforcing a city taxi ordinance requires a different focus,” del Pozo said. In a November report, del Pozo recommended that the city hire a part-time taxi regulation enforcement officer to track whether taxis are operating properly in the city. Del Pozo said city officials did act after receiving reports that Blazer drivers were operating as Uber drivers, persuading the car service company to discontinue agreements with those drivers.